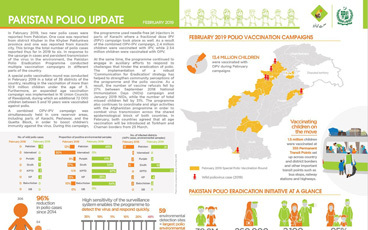 On World Children’s Day we look at how the polio eradication programme contributes to ensuring children receive vital vaccines against polio and other vaccine preventable diseases. 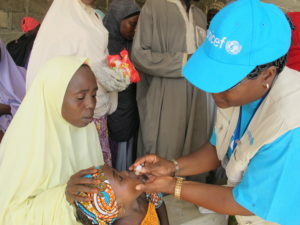 In Nigeria’s north-eastern Borno state, children displaced by ongoing conflict are being reached with essential immunization and health care services, thanks to a strong network of Volunteer Community Mobilisers established by the polio eradication programme. Two-year-old Hafsat Khalifa waits patiently in line with her mother, Hadiza. Hadiza is one of many women who’ve brought their young children to receive vital immunization at the local health camp in Maiduguri. Hafsat knows she needs to open her mouth wide when it’s her turn to receive the oral cholera vaccine just like she did when vaccinated with the Oral Polio Vaccine. She displays the confidence of a seasoned pro, although in reality this is the first year she has received any health services, having been born into an area of conflict. Along with these two vaccines, Hafsat will receive other much-needed health care during today’s visit. Hafsat is one of many thousands of children affected by the humanitarian crisis in north-eastern Nigeria. The conflict has resulted in a surge in internally displaced persons, with limited access to medical care, leaving millions at risk of life-threatening diseases. Since four cases of wild poliovirus type 1 were detected in Borno in August 2016, an outbreak response for polio has been a top priority. But it has been carried out hand in hand with broader humanitarian efforts to meet the health needs of vulnerable populations. UNICEF’s vast network of volunteer community mobilisers have not only played a vital role in ensuring that children like Hafsat receive OPV and other health services every time they are offered, but are leveraging the skill-set they’ve gained from their expanded training to impact child and maternal health far beyond polio. In addition to receiving the oral cholera vaccine today, Hafsat’s nutrition status will be assessed at the health camp, and children identified as malnourished will be referred for receiving therapeutic food. This important network of polio vaccinators, with years of experience in reaching children with polio vaccines, has made a huge difference in halting the spread of cholera and meningitis outbreaks in Nigeria in 2017. They are also helping create awareness and generate demand for the upcoming campaign against measles. The reach of this network even extends to protecting children before they are born. Volunteer community mobilisers provide critical antenatal care for pregnant women that can save the lives of mothers and babies alike. And this year, for the first time ever in an emergency humanitarian setting, antimalarial medicines have been delivered on a mass scale alongside the polio vaccine, reaching 1.2 million children in a campaign in August. For families in Nigeria’s north-east, many who have fled their homes in the face of ongoing violence, this life-line to access essential services is critical to ensuring their children can grow up protected from vaccine-preventable diseases.